The following notes were taken at a talk given by Swimming Coach Bill Furniss, Nova Centurion Head Coach and Coach to Olympians such as Rebecca Adlington. This talk was part of the UKCC/ASA Senior Club Coach course. Produced a great long list between us which Bill simplified to being performance driven. i.e. if you’re not improving competitive performance you are not coaching, you are teaching (or supervising). Only two people count; the coach and the athlete. (Realise why directing & coaching have so much in common, the targets of the coach working with athletes to produce a result like the targets the director has working with actors to produce a result). It does n’t allow boys to be boys. CF the US College System. Ref: Coach: A Season with Lombardi. Tom Dowling. 1970. The appropriateness of your philosophy to the context within which it will be applied. Swimmers are starting to move around and leave coaches because they want a particular style. Shot to pieces by a dreadful night and thrown by the clocks going back, even though this gave me an extra hour in bed, I still get to Nottingham late. Only 5 mins but the swimmers were attacking the water and our group and divided in two with half taking a lane while the others assessed their coaching styles. I apologised to Bill Furniss and joined my group trying to put this gaffe behind me. We judged our fellow coaches harshly then had a go ourselves. J & I took a lane of 15/16 years olds, introducing ourselves to Kyle, Eddie, Shannon & Gina. This is for swimmers achieving national qualifying times. Age 13 to15. The objectives were to keep the heart rate up, to keep the pace even, and on the IM speed up so as to get within 15 of PB time. Two coaches to three swimmers gave them too much attention, but talking it through with J we could divide the responsibilities so that I took stroke count and watched their turns. My stopwatch wasn’t working so I couldn’t get stroke rate, a nuisance as it meant my having to count 25m at a time – It gave me the results though. Sometimes I gave too much +ve encouragement instead of delivering the objective loosing the fact that I don’t want them to cool down or get too much rest. K wasn’t able to keep up and having spoken to him I pulled him out – he’s ill.
E’s pace was like a roller-coaster, anywhere between 19 & 22 and on his FC turn in particular gives no UW kick and his glide was short. With the girls they had an even pace, but weren’t reaching their targets on heart rate or their times on the IM so we had to get them to up the pace. We set them right on all of this, E going for maintaining a faster, steady pace, but only getting a reasonable dolphin kick out of his turn in the last IM while the girls, technically v.accurate, had to pick up the pace and succeeded in doing so. Two coaches to 1 lane, with only 3 in the lane! An extreme ratio but it showed the advantaged of having a few people more poolside. Bill always has TWO stop watches running. He gives times & stroke rate and knows if a swimmers is on or off target and tells them how to correct this. Poolside we have the Nova Centurion A1 squad across all eight lanes of this 25m pool. Bill Furniss talks to us during the warm up, we then take down the main set and go and deliver it. I picked out the swimmer whose technique I most liked, a guy called Andy Mayor who was going up and down FC in 16 strokes. He had in the lane with him the Paralympic swimmer Sam Hynde. I woked with M. We introduced ourselves then assisted them to meet the various targets on the set. Unit 1. The Senior Club Coach. Arrive in ludicrously good time as I was uncertain of the route to Nottingham or how to find the university & specific lecture room. Just as well! I made the mistake of going through Nottingham during the rush hour, end up back on the ring road going south to the M1 so if I hadn’t given myself an hour or more to play with I would have been late. Park next to a guy stepping out of soft top Black Porsche with the registration H20. Trim, Mark Foster in his Fifties fit looking with grey hair. He had a bag with a projector in it so I guessed he was the guy. Half an hour later I meet Bill Furniss, the GB & Nova Centurion Swimming Coach who helped Rebecca Adlington to a couple of gold medals at the 2008 Beijing Olympics. The voice on the phone didn’t marry with up the young, preppy, clean-cut tall young man who introduced himself. His excuse for my hearing back from the IoS about the course work I submitted in June is that they have 250 in the Coaching Programme but had planned for only 100. So they’ve taken on more than they can manage. They’ve had £25,000 in registration fees alone so they ought to have a administrator at least. Colin trained under Bill. Immediately felt I was with the right person. Bill. Early 50s. Athletic. Looks good in a T-shirt & shorts & drives a black soft top Porsche. Coach, Club Coach, Level 4 & Level 5 … as well as picking up a Sports Science Degree from the Open University on the way. He was a competitive swimmer in his day (200m Fly), and for a period was a successful salesman (he says) before getting into coaching. He was an assistant coach for a mere 4 months and has been with Nova in Nottingham for 28 years. A County Council funded role which has enabled him to produce 300 internationals over 20 years and 10 Olympians. 13 of the 24 in A Squad are internationals. Which can mean they have no plan and from past experience could mean long breaks and a good deal of waffle, or simply reading from the manual. BF was quite the opposite, he is in command of the subject, talk in detail without notes and has the authority to question what the ASA is putting out. A A mum whose son swims. Leicester County Development Coach & Occupational Paediatrics. Coaching 8 years. J Northampton SC Took over from Mark Perry Admits to being pushy and finds it hard to resist palling up to BF and plugging her brilliance. M An Ex-Swimmer and Coach from Birmingham. Early or mid twenties and got himself digs in a Nottingham Uni Hall of Residence. Jackie wants him to join Northampton SC as an assistant Coach on £18k. A Level 1 in 1998. A parent. Coaching 6 months at City of Coventry. Formerly Int. Trampolening & diving. A Qualified Teacher. M A milkman from & an assistant coach and ex-footballer. Parent, committee, chairman, poolside helper & assistant coach. Taking time out of work, i.e. holiday, to do this. Usually gets up at 2.30am. Hopes to quit his milkman job in April 2009. 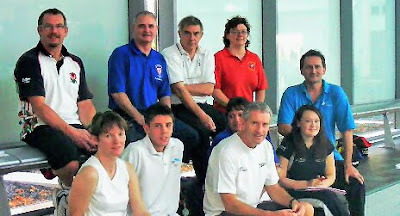 A group of parent poolside helpers, teachers and wannabe coaches. A few have it, several don’t. Some have the personality, several don’t. J Hoddoston SC. (As Michael I think). 15 National Swimmers, I think. Ex. County Swimmer herself. Secretary & conference Organiser. 2004 Club Coach & Diving Level I. Has a sports study degree. T Glossop. Coaching 10 hours week. Rugby Player. Til daughter born. Teaching/coaching rugby. J Lives & breathes swimming. Father was terrified of water. (Dropped in the deep end as a child). Raised in Swansea where she swam competitively to age 13. Dropped it for 10 years +. Now back with a vengeance as a volunteer with a local development squad. H Retired bloke with an IQ of 90 who looks like he used to smoke, lives in a mobile home & will soon need a zimmer frame & a hearing horn. As a set up this bunch of characters reminds me of the Vicar of Dibley. Just as we rarely see the Vicar with her congregation, we rarely need to see the coaches/teachers poolside with kids. Joined by Olympian Mel Marshall who is thinking of becoming a coach. She is part of the programme ‘Athletes into Coaching’. Initiative directed at young athletes coming out of their sport orientated to what they’ve just done and will be doing with a mind set to suit them rather than the oddballs from the amateur/volunteer club based circuit).